Whether you plan full garage door replacement or you simply want better performance from your existing unit, it is normal to focus on spring selection. This is the component which bears practically the whole weight of the door during opening and closing, leaving very little work to the electric operator. That is why it must be chosen with care. Learn more about what is on offer and how to make the right choice based on your specific needs. Extension springs - These come in a set of two. They are fairly short and are installed on both sides of the door, usually over the horizontal tracks. They stretch and contract to enable the movement of the unit. They have special safety cables which keep the unit in place in case they get broken. Torsion spring - Most residential systems require a single component of this type. It goes over the shaft right above the door. It winds and unwinds to operate the unit. Each component has a specific size and an estimated cycle life. There are different types of torsion coil trampoline springs depending on the design and make. Design options - The standard components are mounted over the center of the shaft. There are also models designed to be mounted on the side of the shaft and ones made to be fitted inside the shaft. These two types are regarded to be safer to replace. Make options - The galvanized components are made from steel which has received zinc coating through galvanization. This coating provides protection from rust and corrosion. The oil tempered springs are made from steel wire which has been dipped in hot oil. They are designed to withstand greater exertion. Here are the things which you have to take into account in order to make the right choice. Consider the size and weight of the door - Larger and heavier units typically perform better with torsion springs while lighter ones can do just fine with a pair of extension components. 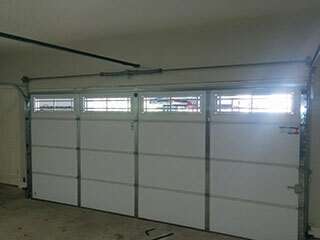 Evaluate the operation frequency of the overhead door - If you have a heavy unit which is operated many times during the day, you can get reliable operation in the long term as well as in the short one from oil tempered garage door spring. Decide how often you can provide panel cleaning - Systems which use oil tempered springs require more frequent cleaning as there is black residue deposited on the panels when these components work. Check the estimated useful life - This will help you to evaluate the durability of the component. Assess the strength - Thicker components with lower gauge tend to be tougher than their counterparts. No matter what overhead door springs you select, you need to maintain them in top condition and to provide regular inspection. If any issues arise, you can count on effective service from Garage Door Repair Rogers for complete resolution.